This chapter emphasizes ecological validity so that Miranda evaluations give full consideration to real-world circumstances within the boundaries of professional ethics. For Miranda comprehension, recall and understanding can often be tested via recordings by law enforcement and the advisement, pre-waiver interactions, and the subsequent waiver. Miranda abilities are best understood within a hierarchical model. An integrated understanding for Miranda rights depends on accurate recall; likewise, use of accurate recall relies on correct definitions of Miranda-relevant vocabulary. Sophisticated Miranda evaluations often include specialized Miranda measures that provide both nomothetic data as well as case-specific findings. In addition, open-ended (i.e., non-standardized) interviews and observations are essential in capturing the totality of circumstances as required by Miranda evaluations. 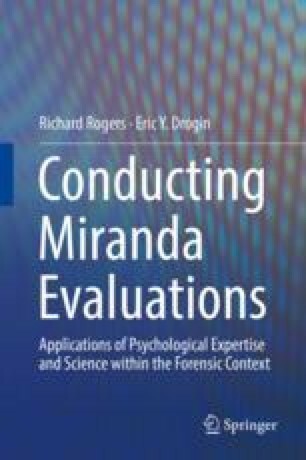 Thus, this chapter provides a step-by-step approach for assessing Miranda comprehension and evaluating any efforts at feigned Miranda impairment.